for Star Alliance Gold members. You can also purchase lounge access—while no major change to the square footage was made, the new lounge offers Scandinavian furniture and materials, a wide range of hot and cold plates, ice cold drinks, charging stations and the most important, free WIFI—just to make you feel at home. Also, the SAS team took the opportunity to show off their new A340 plane cabin interior! What can you expect? Business class passengers will enjoy blankets, pillows & a comfy mattress created by the luxurious bed manufactures Hästens from Sweden. Plus, free Wifi on board, new entertainment system, extra legroom and power outlets. For SAS Plus, passengers will enjoy larger seats, free Wifi, and more leg room. And finally, SAS Go will enjoy new seats as well, and an entertainment system and food/drinks. However, your Wifi connection will have a cost unless you are a EuroBonus Gold & Diamond member which will be free to use. 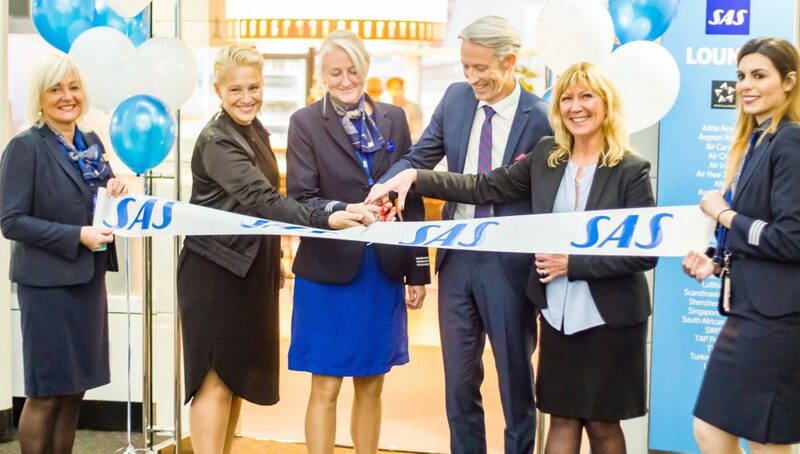 So if you are heading to Copenhagen (CPH) or Stockholm (ARN), stop by the new SAS lounge and tell us what you think! Next articleTravel Deals for Black Friday and Cyber Monday 2017!